Prime Minister Gordon Brown has just called the UK General Election for 6th May. All three parties claim to have the best green policies, and it is interesting to see how much they agree on having some kind of Green New Deal, which will provide jobs in sunrise environmental industries as well as upgrading Britain's energy-wasting housing stock, and renovating the ageing National Grid. Expand offshore wind and marine power and provide government backing for a network of large-scale Marine Energy Parks. While ensuring Britain has adequate, safe and reliable access to conventional fuels, we will only permit coal-fired power stations to be built with clean carbon capture and storage technology, restricting carbon emissions to the level achieved by a modern gas power plant." The Conservatives are pro-nuclear power, and also have plans for a Green Investment Bank to finance environmental projects. "Labour came to power at a time when climate change was emerging as an important political issue. Six months after we took office, the Labour Government played a key role in securing a new international agreement at Kyoto. This signalled the beginning of a period in which Britain has become a world leader on tackling climate change globally and at home. Our 2008 Climate Change Act makes the UK the first country in the world to put its carbon targets into law – cutting emissions by a third (34 per cent) by 2020 and 80 per cent by 2050 on 1990 levels. Our UK Low Carbon Transition Plan sets out a comprehensive strategy for reducing emissions right across the economy, with every government department given its own ‘carbon budget’. With Labour our green policies have become a motor of economic prosperity. As firms invest in insulating people’s homes, renewable energy and nuclear power, and in new technologies such as electric vehicles, we will create around 400,000 new green jobs by 2015 – making 1.2 million British jobs in the environmental and low carbon sectors in all. The Government’s Low Carbon Industrial Strategy has set a framework for active industrial policy, with new firms such as wind turbine manufacturers now investing in Britain." Labour has already unveiled its plans for a £2 Bn Green Investment Bank in the recent budget. "Many people still struggle to pay their fuel bills. Liberal Democrats will require energy companies to simplify the complicated tangle of different tariffs, requiring them to charge families less for a basic amount of energy used, to encourage responsible use. We will also introduce a fair social tariff system for disadvantaged families. We will roll out smart meters to all households within five years and insulate all of Britain’s homes to a decent standard within 10 years. We will immediately raise the requirements of Building Regulations to ensure that all new homes are energy efficient and use ‘Green Loans’ to encourage people to invest in home energy efficiency and micro-renewables. Both Labour and Conservatives support the construction of new nuclear power stations. More nuclear power will soak up subsidy, centralise energy production and hinder development of Britain’s vast renewable resources. Nuclear has a dirty legacy and increases global security risks. We oppose construction of further nuclear power stations. 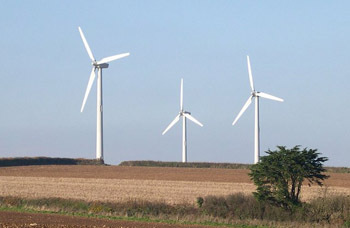 Liberal Democrats will drive a massive programme of investment in renewable energy sources such as wind, wave and solar. We will also transform the National Grid into a smart decentralised grid which will respond dynamically to the changing patterns of energy demand. Smart metering and guaranteed prices will unlock the potential of local and community energy generation, giving people control over the energy they use. We will invest now in the green technologies of the future delivering hundreds of thousands of new and better jobs in the years to come. A zero-carbon Britain will also be energy secure, with action at the EU level, to deliver an energy independent Europe breaking our current dependence on fossil fuels." It is difficult to choose between the parties on these critical issues - the question is, can they deliver the benefits quickly enough to make a difference to the triple problems of climate change, resource depletion and energy security. This is a big task which will affect all the citizens of Britain. It will be interesting to see the outcome of the election, and whether these promises can be delivered.